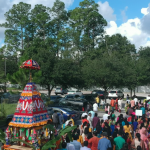 With our beloved Gurunathathar’s and Thakur ji’s blessings, Jacksonville Gopa Kuteeram family celebrated our first Sri Jagannatha Ratha Yathra on Saturday, September 9, 2018. 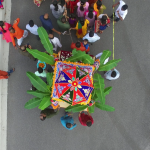 It was the culminating point of the efforts that the local team put together towards the planning of the event, with divine presence felt every step of the way. 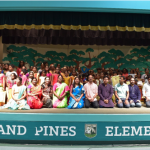 While a group of volunteers, mostly from our Gopa Kuteeram family, built the majestic, approximately 20 feet-tall Ratha tastefully, another group of local ladies stitched the material for the Ratha base and outfits for the Parivar. 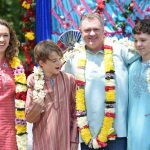 The material for the top portion of the Ratha was custom-made from India. 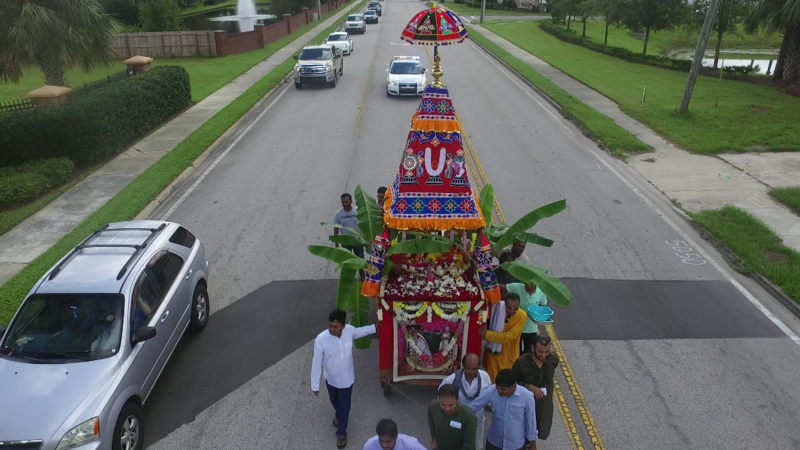 The Indian community in Jacksonville came together to prepare the Chappan Bhog Prasad and lunch for the devotees. 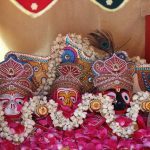 Over 100 people volunteered to cook food, buy supplies and make garlands for the Lord and Ratha decoration. 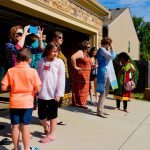 Volunteers also helped out with the photography and drone video captures. 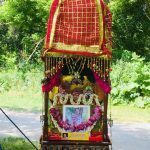 Sri Jagannath Parivar started to the Shirdi Sai temple around 7.30 am and was with Shirdi Sai Baba inside the temple until the Ratha decorations were completed. 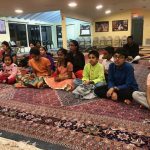 The event started around 8.45 am with pooja and Mahamanthra chanting followed by Gopa Kuteeram children reciting Sri Jagannathaashtakam. 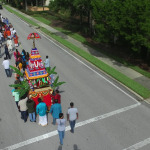 The Parayanam group ladies chanted the Vishnu Sahasranamam and the procession started from inside the Sai temple towards the Greenland Road. 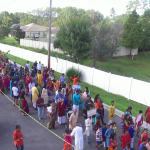 Greenland Road is the main road and both the Shirdi Sai Society and the Hindu Society of North East Florida are a few blocks away from each other on Greenland Road. 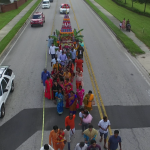 The policemen that were on duty to regulate the traffic on Greenland Rd were meticulous in their planning with several phone conversations ahead of time which resulted in our procession move smoothly. There were 4 cops altogether and we were directed to proceed on the middle/turn lane while the traffic was flowing on either side. Mahamanthra was chanted by the devotees throughout the Yathra. Beautiful young children and women were doing kolattam for Mahamanthra throughout the way. People driving by, rolled down their windows, waving at us and taking pictures/videos. 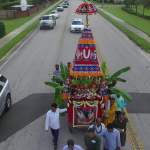 The Ratha was received and honored by the devotees and the priests at the Hindu Temple and all the devotees were served water bottles to quench their thirst from walking in the hot sun. 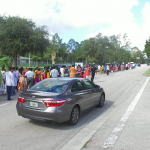 The Ratha started back to the Shirdi Sai temple at 11 am and by 11.30 am the procession reached the Sai temple. Devotees were served buttermilk which was greatly appreciated by one and all. After the aarthi, Prasad was offered followed by Kaliyaiyum Bali Kollum aarthi which concluded the grand event. Devotees were served a sumptuous, multi-state cuisine lunch with a wide variety of items. Volunteering children served food to all the devotees. Varuna Bhagavan blessed us with his showers, for about 10 minutes, after the lunch was well underway.